Don’t just improve your workflow, evolve it altogether. Designed by flow assurance engineers for flow assurance engineers, obot simplifies your simulation workflow and lets you focus on engineering instead of hunting for licenses or building batch files. Run more simulations with fewer licenses. obot’s sophisticated job queue and prioritization system ensures your licenses are always being used to their full potential, including nights and weekends. obot runs as a website on your company’s IT infrastructure. That means anywhere you have access to your company’s data, you have access to obot. 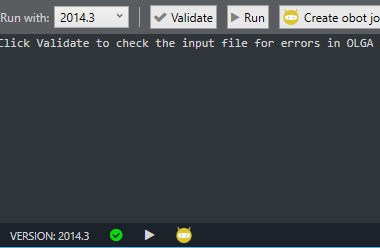 obot includes a debugger application, allowing you to interactively run any input file and, if there are errors, open the input file directly to the offending line. With obot's reporting capabilities, quickly find out how much time is spent running failed simulations, average simulation time per-project or per-user, and lots more. obot automatically tracks thirty different data points that can be analyzed in reports. 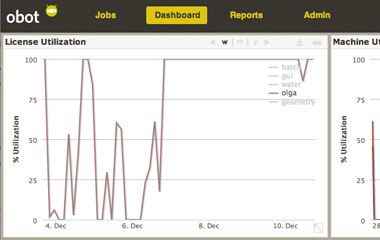 The bottom line is that you will be able to do more OLGA simulations with your existing licenses. In fact, it is our contention that you will be able to do more simulations with fewer licenses. Through the use of obot you gather valuable information over time. This information can be used to create and track KPIs. For example, for each submission, the number of failed simulations is logged. Over time this information in concert with the other information gathered by obot can be used to identify potential . Prior to the development of this application, we measured the OLGA utilization in several of the best flow assurance companies. Shockingly we observed that the best utilization was less than 30% over the course of a year. In most cases it was significantly less. With obot, an organization should be able to eliminate AT LEAST one license for every three. Prioritize, monitor and control the simulation queue. obot allows power-users and administrators to adjust simulation priorities to ensure that your OLGA simulation results are ready when needed. Sleep well knowing that obot works around the clock scheduling simulations according to your prioritization. Users can quickly build reports through an easy to use drag and drop interface. The reports can be filtered to provide only the needed data. The data can be copied or exported to excel. In fact, all of the information gathered by obot is easily exported. Of course reports can also be saved for future use. Users do not have to worry about ensuring licenses are available to run their cases. obot works with the license manager to ensure that the OLGA and module licenses required to run a case are available before it is launched. Your case will never again fail for lack of a license. The obot debugger traps typographic errors instantly and points you to the line number with the error. Numerical instabilities can be found by running a debug job from the same interface. obot prioritizes debug jobs higher than normal jobs thereby reducing turnaround time. Real-time dashboard allows quick overview of the current state of license utilization, computer utilization and simulation speeds. Through the use of obot, valuable information is gathered from users over time with no additional user-tax. This information can be used to track performance of projects, users, and clients. How much time do you spend tracking software time? With obot, you can get software time by project, client, or week, INSTANTLY! Not just that, obot lets you track time per user, time on failed simulations, average real-time factors per project, or per user, and a whole lot more! obot notifies and/or requires approval from power-users when certain events occur such as when a user submits a simulation at higher prioritization than the project's default priority level. Authorization processes are easily completed by simply clicking on the link provided in the email. Monitor license and module utilization in real-time as well as track utilization through time. This information allows you to make smart decisions about the number of OLGA licenses needed to support your current business. obot helps you decide when you should upgrade your OLGA computers. Computational horsepower is relatively cheap compared to OLGA license costs. Should you buy a faster computer or more OLGA licenses? obot provides each OLGA computer a SCORE so you know when to replace your existing simulation computers. obot lets you add a computational resource effortlessly. Just install the obot launcher component on any computer on the network, and the obot takes care of the rest. Retiring an old resource is simply a matter of pulling it off the network! obot allows fine grained control over resources such as setting the number of simultaneous simulations on a computational resource. obot lets you turn your lightly-loaded computers into simulation machines while still leaving room for other functions. obot (pronounced oh-bot) is a software program whose primary purpose is to optimize the utilization of OLGA licenses, and OLGA computers. 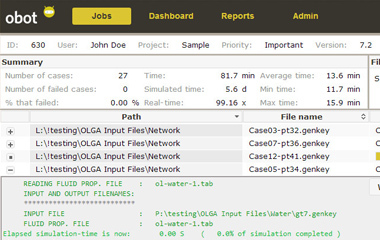 It achieves this goal by allowing users to schedule OLGA simulations without worrying if an OLGA license is available. obot runs 24-7 scheduling user submissions when licenses are available and according to team priorities. What version of OLGA does obot support? All versions of OLGA 5, and later are supported. Can I run OLGA simulations without using obot? Yes, but only if a license is available. Remember obot's primary purpose is to keep your OLGA licenses fully utilized. Can I access obot through the internet? obot is a company cloud application designed to be accessed from the web. Your company's IT will have to determine if it will allow access to obot from the internet or strictly from the company intranet. Does the obot scheduler take into account for OLGA modules that are required for a job? obot licenses can be leased or bought. The licensing model consists of two type of licenses; a server license which is licensed per site, and a user license which is licensed per user. User licenses are required for each individual using obot but can be recycled as users change jobs or leave the company. How do I add user licenses? User licenses can be purchased at any time. The more user licenses purchased at once the cheaper each user license is. The new user license keys are added to obot through the admin menu. Once the licenses are added, obot will resume accepting new user registration. Can I buy a global license? Sure; however, it is important to note that using obot globally without the necessary global OLGA licenses would be a violation of your OLGA license agreement. Yes, please contact sales@evoleap.com to setup a trial. Can I buy obot debugger separately? Not yet. obot debugger not only helps users debug olga file syntax but it also submits debug jobs to obot server. Currently obot debugger will not work without obot server. How much does obot cost? What does Maintenance get me? Maintenance is an annual subscription plan to help our customers keep current with new software releases. When we release a new version of our software, customers with a current maintenance subscription can receive the upgrade at no additional charge. Maintenance also allows you free access to our customer support servces. What technology was used to build obot? obot was built using the latest web technologies. See requirements for more details. What type of Hardware does obot require? Minimum Hardware requirements can be found in the requirements document. Currently obot web client supports any modern browser. The most advanced flow assurance tool, period. flotools is a powerhouse of pre- and post-processing tools to help you do more flow assurance and less data manipulations. 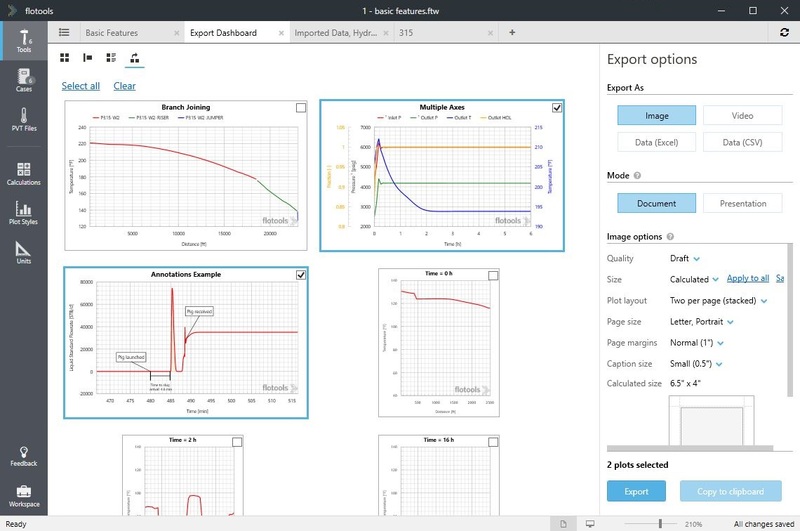 Whether editing input files, creating and running parametric studies, or plotting and analyzing simulation results in real time, flotools has the power to do anything you need with unparalleled ease. Plotting dashboards let you organize your analysis for each study you undertake. A wide variety of plot types are available, outside of the standard trend and profile plots, including X-Y plots, surge volume plots, parametric plots, and 3-D holdup plots. In-plot annotations, and notes make it a snap to call attention to the points of interest. Automatic calculations, user-defined variables, and a host of intelligent features lets you focus on the analysis and not on the formatting of the plots. Every tool in flotools is designed with reporting in mind. With a variety of export options, from images, to Excel workbooks, and videos, flotools gives you crisp, clear exports that can be dropped in to a document or presentation in an instant. No more blurry lines and stretchy fonts. Plot styles allow you to customize the visual elements to your liking - if you have a standard font you would like to use, or if you want to embed your company logo on all plots, no problem. Save and share your styles with your entire team to get consistently formatted charts from your whole team. What you see — is what you get! flotools has tools for pre-processing, simulation, analysis and post-processing — and we are just getting started. With the introduction of flotools version 2.0, we have expanded the capabilities into new pre- and post-processing workflows and we plan to keep adding to the list of tools. 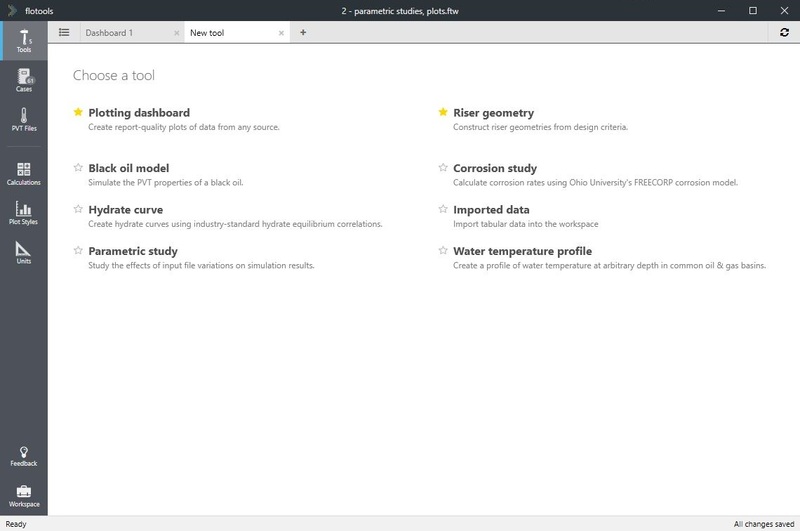 The goal is to have every calculation and analysis you do for a project captured inside a flotools workspace; well documented, annotated, and linked together so assuring the quality of your work is easy. When you have to get back to your project after a year or two for an extension study, you do not have to go digging around multiple files to figure out what you did - they are all in one place. flotools exposes its internal calculation engine so you can define your own user-defined calculations, and derive new insight into simulation results by calculating derived quantities. flotools vector mathematics and units-aware calculation engine allow you to perform tasks that would be extremely cumbersome in Excel. With flotools 2.0, we have calculations that go much beyond these algebraic derivations from simulation results. The riser builder has a catenary solver, and we have incorporated Ohio University's FREECORP and built in our own ion tracking calculations on top of that so you can do life-of-field corrosion calculations using flotools. Angle class distribution, advanced slug statistics and a full-blown CPA based hydrate calculation tool are all coming in the very near future. flotools has been built, refined and fine-tuned to increase your efficiency in preparing input files and analyzing results. With flotools taking care of pre- and post-processing workflows, you can save on those hefty license fees of simulation GUIs. Built-in integration into obot and Excel extends the reach of flotools into your entire flow assurance workflow. A flexible API also allows extensions, such as proprietary corrosion modules, to be added in easily. 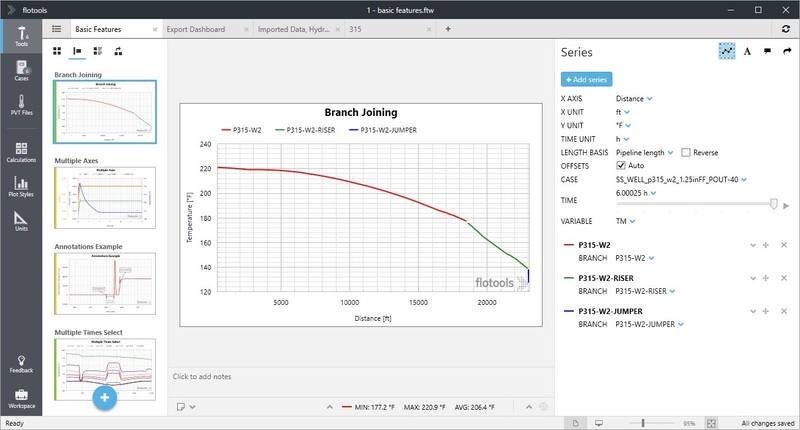 Whether finding the files to work with or variables to plot, flotools uses a search-driven interface that makes it very easy to find and work with large amounts of data. flotools was built by flow assurance engineers and its design was conceived and fine-tuned while working on flow assurance projects. We know what you need to get done and how to do it quickly. flotools makes it easy to collaborate with your coworkers by always saving automatically and allowing you to share your work with others. flotools is a one-stop shop for all your plotting needs. Apart from the traditional trend and profile plots, flotools lets you create X-Y plots and cross plots across cases easily. Plot templates and styles make it easy to create uniformly formatted plots to drop into your reports. flotools can even generate summary tables that can be dropped straight into your Word documents. flotools includes a library of calculated variables that allow you to plot variables not output by your simulation engine. Or, you can define your own custom calculated variables. “flotools is an essential piece of supporting software for my flow assurance team. Following purchase, flotools immediately improved the speed and consistency with which we can generate results from Olga, and streamlined our QA process. flotools is a critical component of our work process, increasing efficiency and quality. 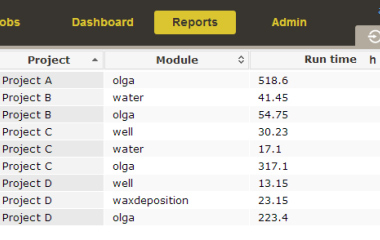 “Our initial approach to using flotools was driven by the need to analyze OLGA output with a limited number of OLGA GUI licenses. After actually using the tool, we discovered the true value behind it; flotools is not just a plot visualization software, it is a new way of analyzing simulation data, by collecting several cases in a chronological fashion, fast deployment of otherwise complicated output, superior presentation of results, and all of these presented in a simple interface. flotools is flow assurance software for pre-processing and post-processing simulation data from industry-standard modeling applications. For more information, please check out our brochure. Can I build network models in flotools? No. flotools does not currently support building a full model. However, some pre-processing tools let you build pieces of a model (riser builder) or generate input file variations (parametric studies) from a base input file. What versions of OLGA are supported? All versions of OLGA 5, and above are supported. Can flotools integrate with obot? Absolutely. If you have an obot server, flotools can queue parametric studies on the server and open results for your completed obot jobs. Yes. Contact us for more information and to setup a demo today. flotools is licensed per individual user, similar to other commercial desktop applications such as Microsoft Office, or as a concurrent license, similar to engineering applications such as OLGA. Some tools in flotools may be licensed using concurrent-use tokens. How much does flotools cost? flotools is very affordable. Please contact us for more information. What are the requirements for running flotools? A Windows XP or later (7+ preferred) computer with the .NET Framework 4.0.
flowpad is the missing text editor for OLGA. With all the features you expect from modern text editors, including keyword coloring, file diff, help tooltips, and much more, flowpad lets you create, edit, and validate your OLGA input files without using expensive licenses! On top of being a full-featured text editor, flowpad includes OLGA specific formatting tricks that make your input files easier to read. Remove unnecessary line breaks, line up keys for easy quality checks, collapse and expand sections of your file for easy navigation, and choose between light and dark color schemes! All the neat tools that are available to developers in integrated development environments like Visual Studio are now available to you for OLGA inputs. 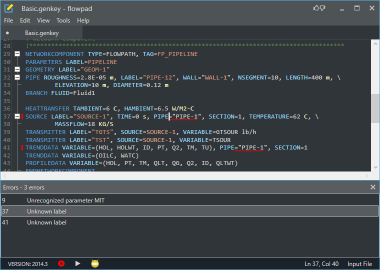 flowpad automatically narrows down your choices for keywords, symbols, label references, variables, terminal connections, etc. It even narrows down output variable choices based on what features of OLGA have been activated (slug tracking variables are only shown when slug tracking is turned on)! flowpad detects typos and missing references in real-time as you are typing. For some of the more complex logic, flowpad lets you use OLGA's own validation logic without using a license! You can be sure when you finally have a license available to run your file, your simulation will actually run! Even with a valid input file, simulations still crash at run time due to numerical instabilities. You often need to tweak simulation parameters to get your simulation to run without crashing. flowpad automatically detects OLGA versions installed on your machine and lets you launch a simulation without leaving flowpad. 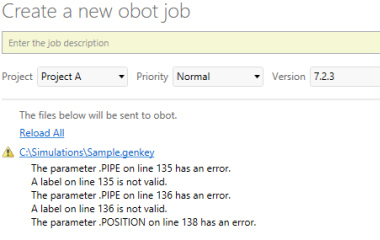 If you have obot, you can even submit your simulation to the obot queue right from within flowpad! flowpad is user-friendly and intuitive, with powerful comparison and editing features that allow input files to be quickly generated or updated. Built-in validation matches the input file with OLGA version specific syntax. Time is money! Errors cost time or could result in design costs. flowpad reduces errors by visually rendering input files and highlighting differences, greatly reducing model review cycle times and increasing model fidelity. flowpad is built to run on Windows computers and recognize OLGA input file types. Built-in version checks ensure that input files are generated, validated and run with the correct simulation engine version. flowpad also integrates directly into obot. All things you have come to expect in a modern language-aware editor are available in flowpad - syntax highlighting, find and replace across files, tabs for working on multiple files, etc. With light and dark themes available, you will find working with flowpad a pleasure. Folders on your computer or network can be conveniently accessed from a project tray on the left making it easy to find cases in a project. Recent files and folders list are stored for quick reference. Input files can also be opened by double-clicking or with the right-click context menu in Windows Explorer. External files referenced can be opened or you can jump to a referenced model element from with the input file. An input file outline or detail view can be instantly displayed by using the expand or collapse all feature. Input files can be compared side-by-side with differences highlighted for quick checking and demonstrating unique features of a given case. flowpad has deep knowledge of OLGA input syntax allowing it to suggest keywords as you type. Symbols, units, output variables, and connection terminals are all filtered down to only the relevant options making it easy to make the right choices and greatly reducing the amount of typing required and consequently the risk of typographical errors. flowpad has quick formatting options allowing you to remove line breaks, group and indent statements, and even line up the keys in continguous statement blocks so as to enable quick and eays visual scanning of the input parameters used in your simulation input. flowpad brings the OLGA help manual to your mouse pointer. Not sure what a specific input key means? Just hover over the key and a tooltip pops up with a description of the key. Hovering over label references pops up the definition of the label allowing you to ensure that the right components are referenced at the right places. flowpad checks for errors as you type which makes it much more efficient to catch and fix mistakes. Input files can also be validated using the OLGA engine itself without using a runtime license! Simulations can be launched from flowpad and either run immediately or scheduled with obot! 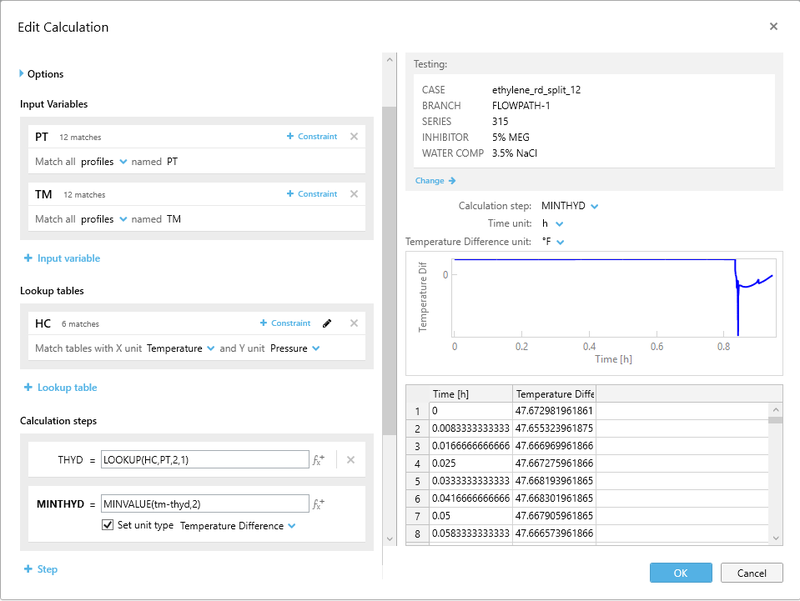 For numerically unstable simulations which require iterative debugging, you can fine tune your simulation without leaving the comforts of the flowpad environment. flowpad autodetects the versions of OLGA you have installed on your computer and lets you choose which version to use when launching simulations. Terms and Conditions governing this software. Or try the premium features for 60 days. flowpad is an awesome OLGA input file editor that combines the simplicity of a text editor with powerful features that make it easy for anyone to work directly with OLGA input files. Yes. Contact us for an affordable license of flowpad Professional, or download the free edition today and sign up for a 60-day free trial of the Professional features. flowpad is licensed per individual user, similar to other commercial desktop applications such as Microsoft Office. How much does flowpad cost? flowpad is very affordable. We are pleased to offer a free version of this time saving tool and try our advanced features for 60 days. If you are a serious flow assurance professional, and are convinced you want to switch to the Professional version, please contact us. What are the requirements for running flowpad? A Windows 7 or later computer with the .NET Framework 4.5 or newer.